24141, 24085, 24079 & 24134 at Swindon Works on June 12th 1977, having been dragged down from Crewe on May 31st 1977. 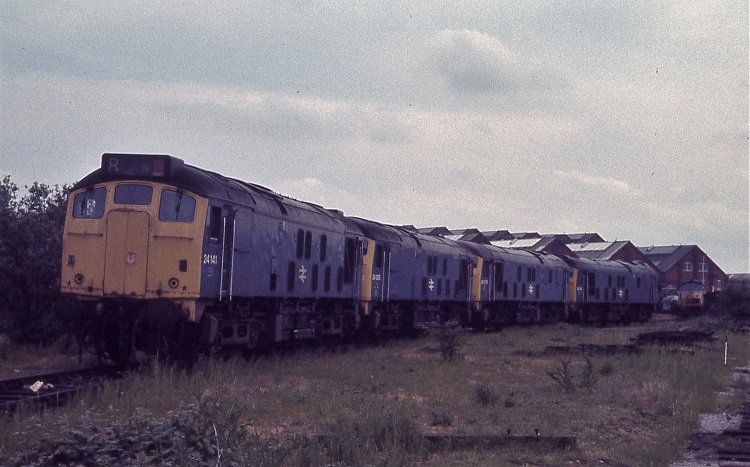 Of these four locomotives, 24141 would be scrapped first during June 1978, the others would be dealt with during September & October 1978. 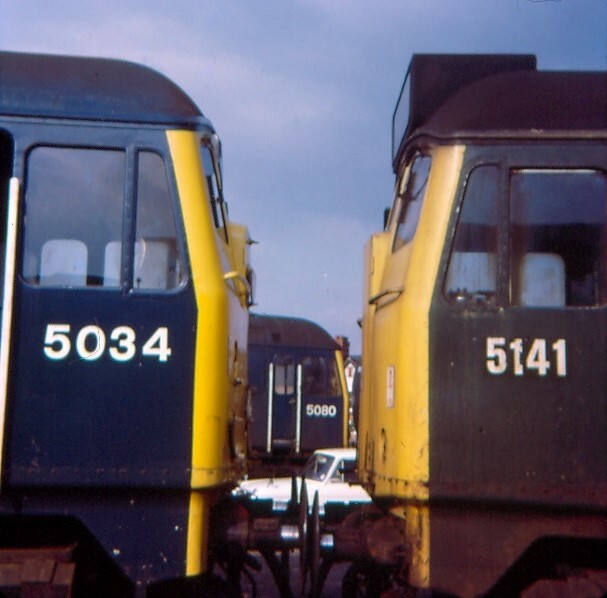 The fifteen year eight month career of D5141/24141 was spent allocated only to London Midland Region depots. October 1962 to Camden (1B). December 1965 to Bescot (2F). April 1966 to Birmingham Division (D02). September 1966 to Stoke Division (D05). 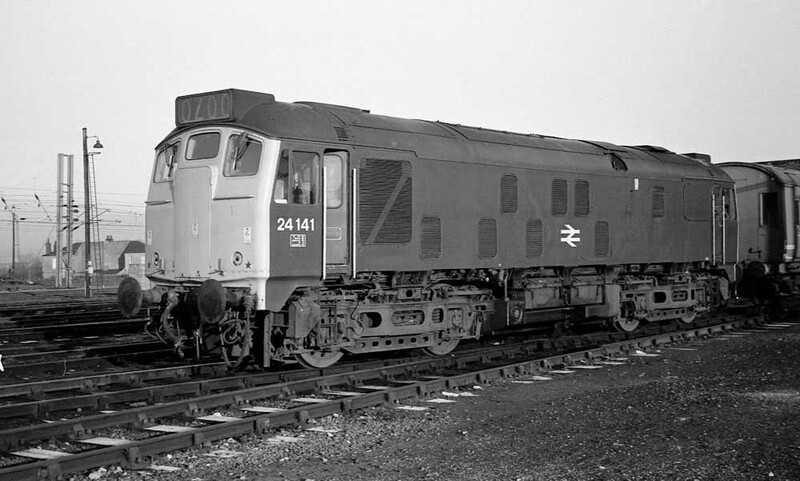 After withdrawal 24141 was stored at Crewe from February 1976 to May 31st 1977 when it was forwarded to Swindon Works and broken up by the second week of June 1978. Movement: 24079/85, 24134/41 Crewe-Swindon May 31, 1977. Noted Derby Works November 1963. Noted Derby Works September & October 1964. 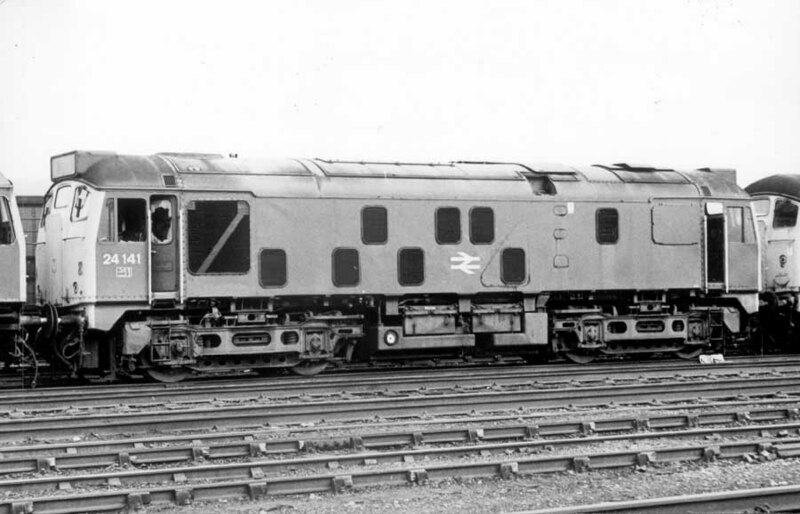 Noted Derby Works December 1966. Condition no month: green livery with full yellow cab fronts, shortened fuel & water tanks, fuel tank fitted with circular gauge, no blanking plate, hand/footholds still present, ridge sided sandboxes, three-rung bogie mounted footsteps, all valencing present. Locomotive still carrying green livery (April). Photograph courtesy Steve Marshall. Chester depot April 22nd 1973, 5141 reveals its non-standard style of numbers. On January 21st 24141 and 25169 were noted leaving Severn Tunnel Junction with a freight headed in the Gloucester direction. Photograph courtesy Tom Sutch. A frosty morning and a low sun provides nice light to pick out the detail on 24141 at Springs Branch on March 28th 1975. At its last repair all the frame level skirting between the cabs has been removed, a gauge has been added to the fuel tank but the gangway doors have not been sheeted over. Condition final: blue/yellow livery, gangway doors present, shortened fuel & water tanks, fuel tank fitted with circular gauge, blanking plates fitted, hand/footholds plated over, ridge sided sandboxes, three-rung bogie mounted footsteps. Photograph courtesy Glyn Weight/collection of Paul Roberts. 24141 at Crewe on April 3rd 1977 waiting for movement to its final resting place at Swindon. Page added August 26th 2016. Last updated January 18th 2019.